RapidCommerce is an e-commerce company in operation since 2004, specializing in racing safety apparel. It is our privilege to provide our customers with a premiere shopping experience. 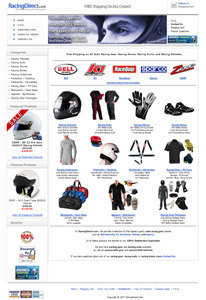 Your Direct source for Racing Shoes, Racing Helmets, and Racing Suits! At RacingDirect.com, We provide a selection of the highest quality auto racing gear brands such as Bell Helmets, K1 RaceGear, Oakley, and Sparco. All you racers out there, get in gear...this website has the green light! 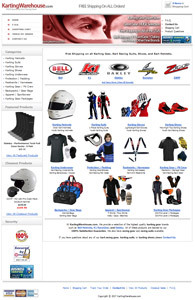 Meeting All of Your Kart Racing Needs with Karting Gear, Karting Suits, and Karting Shoes. Shortly after our success with RacingDirect.com, we ventured into un-karted territory with KartingWarehouse.com and began catering directly to the needs of the karting community. It's that time of year: Get out your Snowmobile Gear and enjoy the season! Here comes winter! Despite the cold, we are working with only the hottest brands such as CKX, Smith Optics, and Vega. 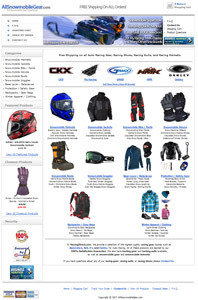 AllSnowmobileGear.com has you covered with a great selection of snowmobile clothing, snowmobile bibs, snowmobile helmets, and more.